The UK's biggest food and drink festival is returning to Tatton Park for another year, and guess what? I have two pairs of tickets to give away to you lucky lot! David Mooney of the New Moon Pub Company. Mary-Ellen McTague of Aumbry and star of the BBC’s Great British Menu. Kim Kaewkraikhot of Thai restaurant Chaophraya. Brent Hulena from Hipping Hall. Your host will be Blue Peter presenter and Celebrity Masterchef star Zoe Salmon. Great British Bake Off star Ruth Clemens will making her signature cake. Steampunk baker Emilly Ladybird will be baking a gin and tonic cake. Cookery School There will be classes throughout the day in the AEG cookery school (in conjunction with the Cheshire Cook School). Demonstrations from David Greenwood-Haigh of Divine Chocolate. Fiona Sciolti of Sciolti Chocolates will talk about the health benefits of chocolate and what makes her own chocolate so special. Al Fresco Dining BBQ Arena - hourly BBQ classes and competitions. Wine Village Showcasing a large selection of wines from a variety of vineyards. Restaurants include Lord Binning, Chaopraya and Stolen Lamb. The countryside bar with hay bales, focusing on British cider and ale. The quirky bar bus - yes it's a bar... in a bus. Regular classes and demonstrations by some of the most talented sommeliers, mixologists and drink experts in the UK. Charles Metcalfe and beer blacksmith Melissa Cole will be talking us through their picks. Cocktail Theatre Top mixologists will demonstrate their skills with hands-on classes. Produce from the local area. Ex-Coronation Street actor Charlie Lawson will be there with offerings from his Prestbury Farm Shop. Street Food Avenue Ready-to-eat hot and cold food from around the world including hog roasts, exotic meats, tapas, churros, burrito, Moroccan tagines, South American prime beef, sausages, pizza, Jamaican and Thai street food. Children’s Cookery Theatre A series of workshops with experiments. City Beach Deck chairs, sand, ice-cream and afternoon tea! There will also be various specialist tea, coffee and fresh juice vendors around the site, and daily live performances. There is a charge of £5 per car to enter Tatton Park. VIP tickets include a free glass of champagne on arrival, access to the VIP tent throughout the day, a taster meal from one of the pop-up restaurant tents, a goody bag and reserved seating in theatre and masterclass sessions as well as a private bar with great views of entertainment stage. Opening times: 11am until 7pm. 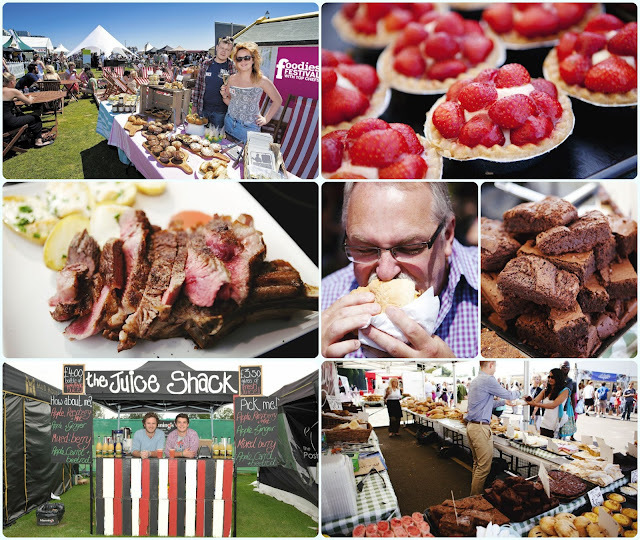 2013 Foodies Festivals tickets are now available from www.foodiesfestival.com or by calling 0844 995 1111. The competition runs from 10th to 13th May 2013. If you win, you MUST send me your details before 12pm on 14th May, or the prize will be passed to the next person. You'll need to let me know which day you can attend. The prizes are two separate sets of tickets, a pair for each winner. The amount of different things to do and see.